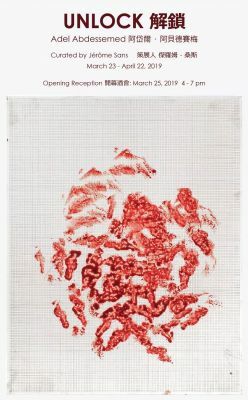 Tang Contemporary Art is proud to present the first exhibition of Adel Abdessemed in Hong Kong, one of the most emblematic artists of his generation, with a new body of work, curated by the internationally known curator Jérôme Sans. Titled Unlock, the exhibition is an introspective journey into the rugged world of Adel Abdessemed. Embedded in political themes, the work of the Franco-Algerian artist is a response to the situation of the contemporary world crossed by all kinds of convulsive movements. Born in 1971 in Constantine, nine years after the end of the Algerian War of Independence, Adel Abdessemed left his homeland under dramatic circumstances in 1994. From drawing to installation, from sculpture to film, he is the author of a large formal repertory composed of mass media images, religious symbols, intoxicating substances, animals and relatives, that he manipulates, stretches and reinvents in a wide variety of approaches. His Christ in barbed wire, his videos of animals’ massacres, his carcasses of folded planes and burnt cars, draw a vision of the world indexed on the horizon of sacrifice, disaster and contemporary traumas. Immigration, violence, misery conveyed by media images are captured and condensed in freeze frames, cropped, enlarged, transposed into sculpture-objects that enhance our experience of reality. The exhibition title Unlock refers to the mystery part of creation, which crosses the entire history of art, a story of codes that are constantly broken, encoded, disconnected and reinvented, as well as the condition of the world today, a digital age and era of data protection, in which all our information and our lives continue to be encoded and hacked relentlessly. At the center of the exhibition space, there is a massive used helicopter, gutted like a fish and lying on the floor in the shape of a ring. If the helicopter is one of the most exclusive means of contemporary travel in an overpopulated world, it is also a military engine or a surveillance object, a metaphor of the drone. Before the invasion of film sets by drones, the helicopter was one of the most used elements in the cinema to film in high altitude or in fast speed all kinds of situations, such as aerial views and panorama with a great freedom of movement. The spectacular piece is a new development of several works such as Bourek (2005), a plane wrapped around himself, like his mother’s pastries, Telle mère, tels fils (Like Mother, like Sons) (2008), three cabins and tailplanes twisted and knotted together, fragile and monumental at once, or his performance Helikoptère (2007), in which, suspended by the feet to a hovering helicopter over wooden plates, the artist compares the act of drawing with the rhythm and risks of the machine and of the wind and swings of his body. His new series of “expressionist” Forbidden Colours (2018), specially made for Unlock, are not made with human or animal blood, but with subterfuges borrowed from the special effects and cinema world, like in many of his performances such as Je Suis Innocent (I’m Innocent) (2012), an impressive self-portrait in which he stands on fire in the street. In contrast to realism, the Forbidden Colours reflect our current world flooded with fake news. These abstract canvases play with the ambiguity of blood, even though they are painted with a liquid used in cinema to simulate wounds or death in a hyperrealistic way. Adel Abdessemed takes us into a world of simulation and illusion, in the age of manipulated images or photoshopped photographs that seem more real than reality itself. As vast frescoes of the history of our humanity, they witness the omnipresence and the instrumentalization of violence, which engenders nothing but passivity and habituation. The imperious violence of their course tells about the suffering and the difficulty of writing the world today. These paintings extend Jackson Pollock's all-over technique, as each painting becomes a palimpsest of spills or dripping decomposed into successive layers of blood, just like the constant spill of violence that is spread out every day beyond all borders. Fascinated by the relentless flow of images, Abdessemed recycles the most powerful forms. He abandons the chronology to stage the dramas featuring collective mythology, to interpret the violence of men whether it is political, religious or moral. He became the chanter of the forgotten, the oppressed, the slaughtered animals, the migrants who entrust their lives to the waves. Like accidents, the works gathered in the exhibition, sharpen our emotional sensitivity to violence, and sometimes construct a form of redemption. They affect our vulnerability by deconstructing our solid and reliable preconceived worldviews. Decontextualized from their historical context, they nevertheless remain as common places of a shared Western visual culture while it is doubted. Abdessemed provokes but does not criticize, he strikes but refuses any commitment or any kind of moral judgment. He tirelessly exacerbates cruelty to increase the spectator’s awareness towards the irrationality of the violent act, encouraging him to take some distance. The exhibition re-enacts this oscillation between the tragic and innocence, war and peace, around which the artist adjusts his voice. “I feel like a messenger of the minimum”, he says.